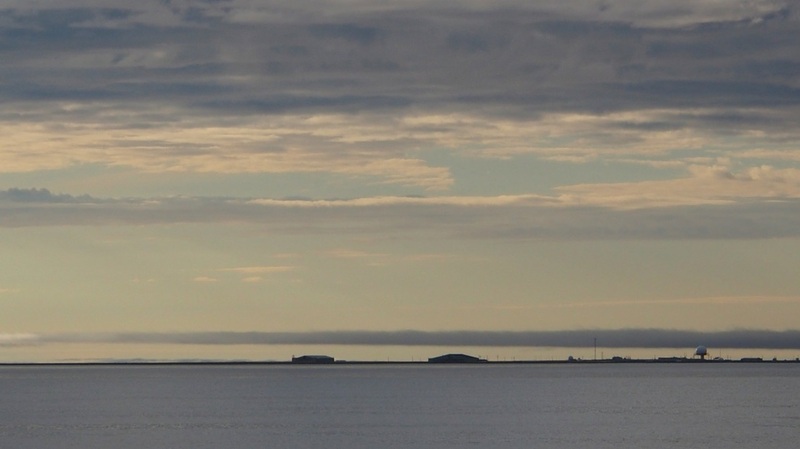 Since yesterday afternoon we are anchored at 3 nautical mile distance from the Alaskan coast, with the little coastal village Barrow on the horizon. The first 'leg' of the expedition is now nearly over; this morning there suddenly were strange new faces at breakfast, scientists that will join leg 2 and are coming onboard today to join the 'handover'. It is strange to see inhabited land after all these weeks! With binoculars we hang out on the deck, amazed by cars in the distance, airplanes, fences, structures. The most special thing, however, was to watch the lights on the horizon during the evening. The polar summer nights are slowly coming to an end, and it's darker during the nights. We also have switched back to Alaska time from UTC time, so the darker moments in the day now actually occur when our biological clock expects them to happen. The advantage of the time change was an extra breakfast and bonus 8h sleep after the end-of-cruise party! The last 10 days were more quiet than the intense weeks of sampling before but we have spent our time well. We have written a cruise report that sums up the tremendous loads of work that have been done and the data that have been collected. 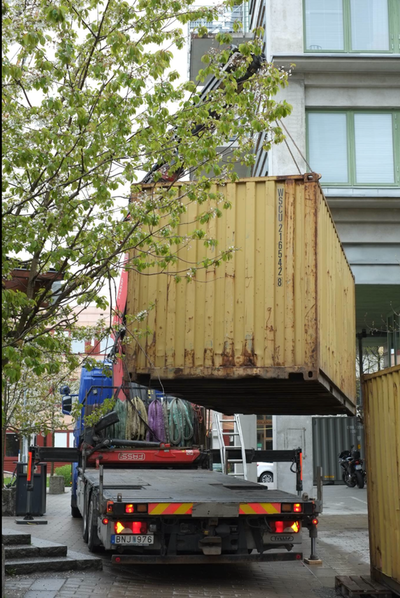 We have packed up our gear, cleaned up the containers, sorted through samples, have been securing lots of boxes in the freezer and fridge containers. We have gotten lots of science done. The sediment work package alone has collected large amounts of mud! 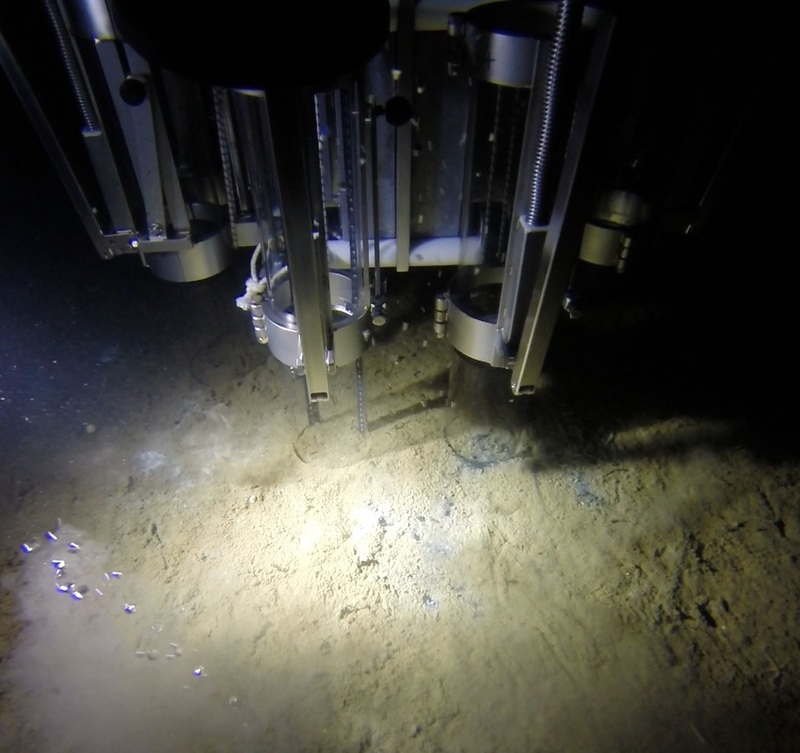 We calculated that we collected a total of 728 sediment cores with the multicorer, and sliced a total of 16 meters sediment into 0.5 and 1.0 cm slices; summing up to 1800 plastic, labeled bags that are now safely stored in a freezer onboard. Lots of good stuff for exciting research to come! Fog appeared today again through the little window in our hut, but the last few days there was bright sunshine 24/7! The ice that we are cruising through is very variable, there are many melt ponds in different shapes and colors, there is dirty ice loaden with sediments or ice algae, ice ridges, and multi-year ice and younger ice. I haven't seen green colors for weeks but I don't miss it yet! We sometimes walk in circles on the heli-deck to relax, think, talk and enjoy the environment, alone with some music or together with a few others. The ship shakes and gently rolls over large ice floes while we enjoy the scenery passing by. Yesterday we spotted a walrus! We are still in a busy working schedule with lots of sampling stations, but the program should slowly start winding down the next days. 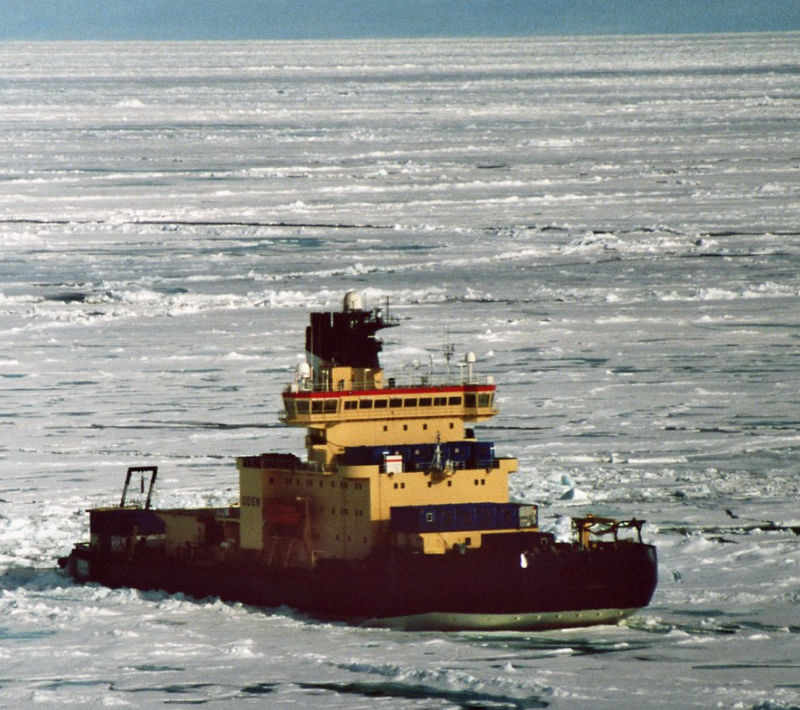 Running these stations and deploying instruments in relatively thick ice has not always been very easy. "Parking the ship" is the first part of the challenge; we create some open water around us when we break the ice but we have instruments both at the bow and at the aft deck and with the (wind) drift and current it is difficult to keep both locations sufficiently ice-free to make our deployments. 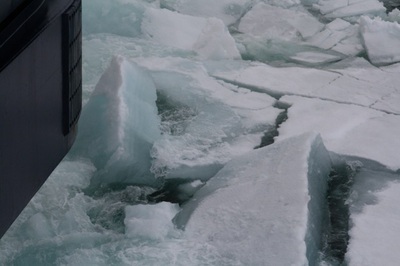 Particularly at the bow, where the CTD is located, this is tricky as it is far above the water and there is no way to manually push away the ice flows. We have the possibility to use a large pump to push the ice away with water pressure but this also obviously affects the stratification, which is something the CTD is measuring. On the aft deck we have more possibilities. There are two fire hoses that we can direct towards ice floes and we can use long boat hooks to push away the ice. With a dense ice cover we stand with two people on the fan tail, secured with harnesses, to try and keep the 'hole' of open water large enough for our multicorer to go through. Sometimes a close call! One time the multicorer was hugging the approaching ice flow when it came up. Thanks to good timing and rapid communication with the crew on the aft deck that operates the winch and the A-frame, it all worked out. We have been getting great cores here, the core tops are undisturbed, and the water above the sediment too. We section one or two cores at each station, and store a few others for more analyses. There are also cores being subsampled for methane analysis, sedimentological analysis and ecological/biological analysis. The latter is done by one of our Russian colleagues; he sieves huge amounts of sediments and comes up with the strangest animals! We are now located around 75 degrees North and 174 degrees East, and tonight or tomorrow we will pass the date line at 180 degrees East. We are then steaming towards Wrangell Island where we will do our last stations. After that we move onwards towards Barrow where 'landing' is planned for around August 20. While time seemed to be creeping by slowly in the first two weeks, the days now seem to unnoticeably transform into one another. Life on the ship is somehow just like the 'other world back home'; we eat, sleep (a bit), work (a lot), hang out with friends in the gym, after dinner or in the sauna. There are small discussions and miscommunications but mostly the atmosphere is great, we joke around, are excited about the things we find and see, and are enjoying the unique environment we are in. Yesterday morning I woke up and walked to the deck on the fourth floor in pure amazement. The sun was very bright, the sky almost completely cloudless, the sea was covered by ice again and there land on the horizon for the first time since we left: Bennett Island (76° 42’ N and 149° 00’E). This remote island is located north of the New Siberian Islands, is a part of the De Long archipelago, and was discovered only in 1881 There are not that many islands on our planet that are so remote as this one! We were brainstorming about how it would be to land there, make a fire, and sleep in tents. We could see large glaciers covering the island, along with black basaltic rocks of 300 to 400 m above sea level. In 2008 I also sailed past this island on a Russian ship, but the conditions were far from perfect then as we were hit by a massive storm! The sampling goes well, we are now working quite intensively in shifts since about two weeks. At all sampling station the sediment team (that I am a part of) takes gravity cores, but last week we also managed to successfully retrieve a piston core of 4.5 m length that covered the complete Holocene! It was a long operation but everybody was happy and excited when the core was safe back on deck. We are now cruising towards station number 47 already so we have covered quite some ground. The last two days we are in very shallow waters around 40m deep which, together with the ice navigation, adds extra complexity to maneuvering the ship as the minimum depth that Oden can steam in is 35m. Last Thursday we had a mid-cruise dinner with lovely food (the cooks and galley girls are splendid!) and great company. It is nice to dress up sometimes instead of appearing with muddy clothing at the dinner everyday! Two days ago we finally, exactly ten days after departing in Tromsø, arrived at our first station in the northern Laptev Sea. Everybody was more than ready to finally start working, even though we knew the work schedule would be quite hectic. Our route was delayed because of thick ice, which according to the captain 'has not been so thick this time of year since 2005'. Fuel, apart from time, is the limiting factor for our journey and if the diesel (in total 1900 ton) goes too fast we might have to change our cruise plan. We now are cruising towards station 6 already and are south enough to be in open water but the first two sampling locations were still in the ice. On the aft deck, the 'back of the boat' there is a large A-frame with a winch that holds our multicorer; a sampling device with eight core liners that allows us to take eight sediment cores per deployment (or 'cast'). The multicorer is loaded with extra lead weights to make it heavy enough to sink into the sea bottom. It was a challenge to deploy sampling equipment in between large, unpredictably drifting ice floes along with lots of slush ice clogging up the surface. Pomerine skuas were hovering above us. Geared up with safety harnesses and boat hooks we stood on the fan tail to push away the ice. Exciting and cool at the same time, we are really in the Arctic! The Swedish crew on the deck are careful, skilled and funny at the same time so it is pleasant for us, the scientist 'crew' working with them. The first deployments took a long time (water depths of 2500 to 3100 m!) but we retrieved nice cores. The different cores are assigned to different people that will each do their own analyses, either on the ship, or back home. On the front deck there is another A-frame with which we are deploying a so-called CTD; a device measuring Conductivity (salinity), Temperature and Depth. Attached to the CTD are oxygen and turbidity sensors, and we soon are planning to attach an underwater camera to it too, to hopefully catch methane bubbles. The CTD is surrounded by a rosette with 24 large grey bottles (Niskin bottles) that can be filled at different water depths. When the CTD is back on deck, it's driven into a little container where a large group of people will take water from the Niskin bottles and fill sample containers, bottles, tubes, and molecular sieves for a very diverse set of analyses from dissolved oxygen to dissolved methane, dissolved and particulate organic carbon, nutrients, and many other things. We are soon heading into a region that is known for so-called methane flares; hotspots in the sea bottom that release methane bubbles. Igor Semiletov, one of the chief scientists onboard, has with his team and colleagues been studying these phenomena since quite a while. One of the main goals of this trip to study these flares and the methane they emit in great detail. Wednesday morning very early we arrived at the ice edge. It was still foggy but just before breakfast the sky cleared up and the sun made the scenery even more beautiful. 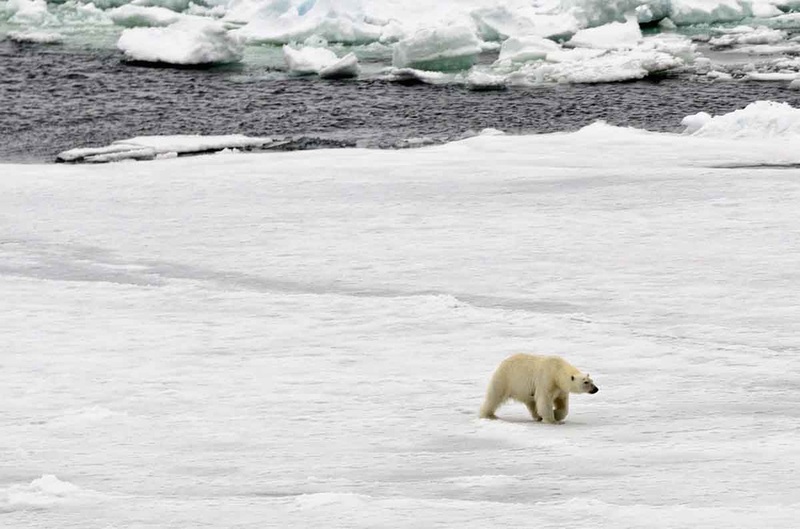 It was impressive and strange at the same time; your gut instinct tells you that 'we should not just go straight ahead towards that massive ice floe' but apart from some vibrating and light shaking nothing happens when we do run over it. A 60 mm steel hull and a special design of the front of the ship makes this all possible. The ice became thicker and thicker when we approached the northern edge of Zevernaya Zembla, the group of islands north of Cape Tjeljuskin near the Vilkitskiy Strait, the northernmost tip of the Eurasian continent. Since yesterday we follow a more or less straight line on 82 degree latitude going eastwards. We were standing on the deck after dinner with mouths open looking at how the 2 meter thick ice floes were being crushed like cookies. 'This is like a fire place but better' somebody said, 'it never gets boring to look at it!'. I totally agreed. The wildlife here is pretty abundant. 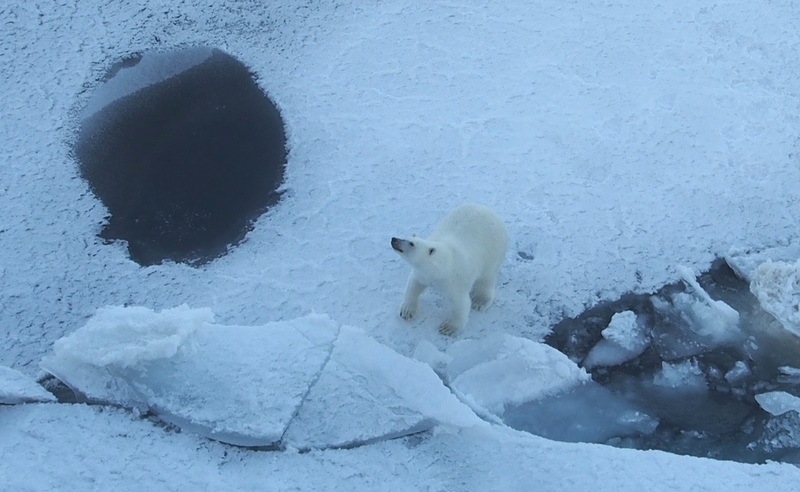 On the first day in the ice we already saw two polar bears. 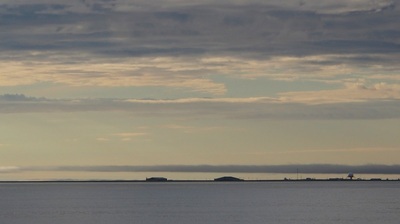 The first one was announced from the bridge "polar bear on starboard side, 700 m distance". It took its time to walk around the ship so everyone had a chance to look at it. 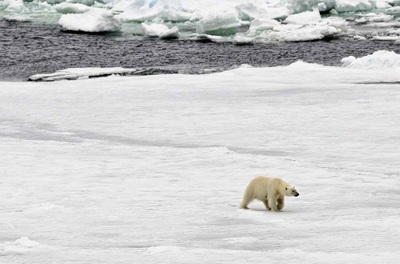 The second one was sleeping on an ice floe and did not see us coming. Suddenly the "dirty snow" got up and starting running away, and we even had to slightly steer away from it to not completely crash the ice flow where it was on. There are also ivory gulls, black guillemots, dovekies, and shearwaters surrounding us. I have seen round and fatty seals lying in the sun on the ice, and the rumor goes that someone has even spotted a walrus. Science-wise, it is still a bit low key at the moment. The biogeochemistry, microbiology and sediment teams are enjoying the relative quietness before reaching our study area, but are busy preparing, fine-tuning and talking about logistics. The meteorologists onboard, however, are already releasing weather balloons four times a day, and people continuously measuring methane and carbondioxide in the water and air already have their systems up and running. In our key study area, the northern Laptev and East Siberian Sea, the station (sampling) frequency will be high and the workload pretty intense basically all the way to Alaska. Our ETA for arrival at the first station is early Monday morning, three more days to go! I now write this post from a slowly rolling lab container on the second deck. It is light outside – the sun will not set the next 6.5 weeks! – but the infamous Arctic fog has surrounded us since about an hour ago. Yesterday late afternoon we lifted the anchor in Tromsøfjorden and headed north towards the Barentz Sea. The weather was splendid, even quite warm, and people were hovering around on the deck, excited but also a bit nervous about this large adventure (8188 km to go to Alaska!). After a few hours of fantastic scenery we reached the open ocean. Six years ago during a similar expedition I remember the Barents Sea as being bright blue-greenish and very rough, but now it could not be more opposite! Very flat and only 1-2 meters of swell, I never expected it to be that gentle. Good hope for limited “fish feeding”. Today we have had a numbers of so-called toolbox meetings where we talk through the different kind of equipment that we’ll deploy from the deck. 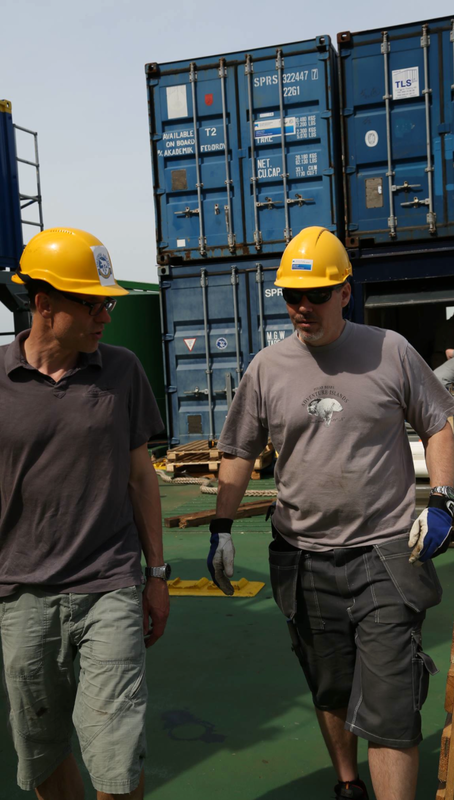 The deck crew will assist us and together we have assessed the main dangers and attention points. Tomorrow we will go through the same toolbox meetings again but then on the deck, actually testing the material. The real final test will be station “zero”, lying about two days ahead when we’ll hit the ice. We also have switched to UTC time now, which we will keep until landing in Barrow. If the ship would follow the official time zones life would be a bit more complicated. So far, everything goes well! About six days to go to the first real station. The whole "package" of preparations, excitement, packing, and some anxity all come together when I board the little boat that drives us out to the Oden, lying in Tromsøfjorden in Northern Norway. The fjord is as flat as a mirror and we slowly approach the more than 100m long icebreaker. The hull is massive and towers up above us when we make a little loop around the ship. Once aboard I receive short but crucial instructions (e.g. what not to flush through the toilet! ), get shown our cabins (that I share with two other girls) and catch up with friends/colleagues that I haven't met since a while. Lots of energy and also lots of chaos; it's crowded with a French camera group, photographers, people finding their way and equipment being installed. You can notice that people are trying to adjust to the idea of being here for the seven weeks to come, some with still fresh goodbyes to families and kids in mind. After dinner we receive a short welcome by the captain, the first mate and the two chief scientist onboard our trip, Örjan Gustafsson and Igor Semiletov. The plan is to take off tomorrow afternoon, a bit earlier than planned to test a technical engine failure that is now supposedly fixed. Better to double-check before we enter the Barents Sea! 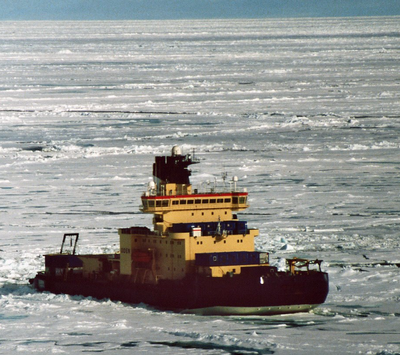 The exact day-to-day position of the icebreaker Oden can now be followed online. The planned cruise track is outlined on a map, along with the current (and past) sea-ice conditions in the Arctic Ocean. You can see that the ship is still in Copenhagen, but departure from Tromsø is in two weeks from now! Check the map below or at http://oden.geo.su.se/map/. Hoi, my name is Jorien Vonk. I am a postdoctoral researcher at the Geochemistry group at the Department of Earth Sciences of Utrecht University. I work in Arctic regions where I study the transport and degradation of carbon after its release from thawing permafrost into rivers and the coastal ocean. The last few summers I worked in continental Siberia in the Kolyma river watershed, near the town of Cherskii. But this summer: heading out for something completely different! Together with a great group of colleagues I will board the Swedish icebreaker Oden to travel north of Russia towards the East Siberian Arctic Ocean. 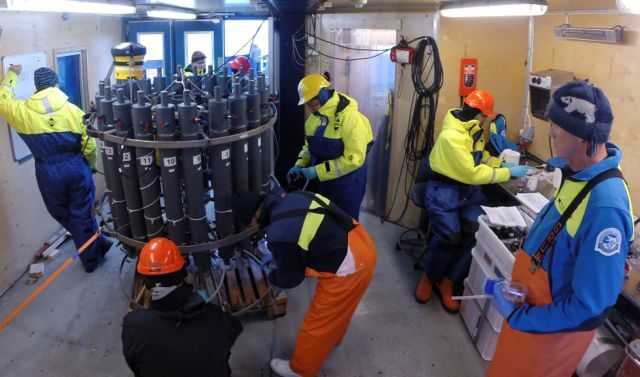 This expedition is officially called SWERUS-C3; the “Swedish-Russian-US Arctic Ocean investigation of Climate-Cryosphere-Carbon (C3) interactions”. We will study the linkages between climate, cryosphere (subsea permafrost and sea ice) and carbon (greenhouse gases). The preparations of SWERUS-C3 started several years ago, but have become increasingly intensive the last months and weeks! 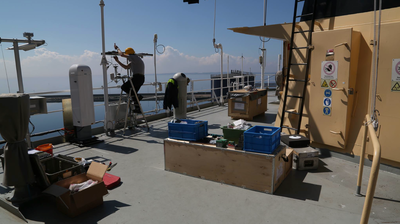 Colleagues from Stockholm have been very busy with testing all equipment, packing hundreds of boxes with instruments and consumables, and adjusting and optimizing the ship for our expedition. The route will be split up in two “legs”. 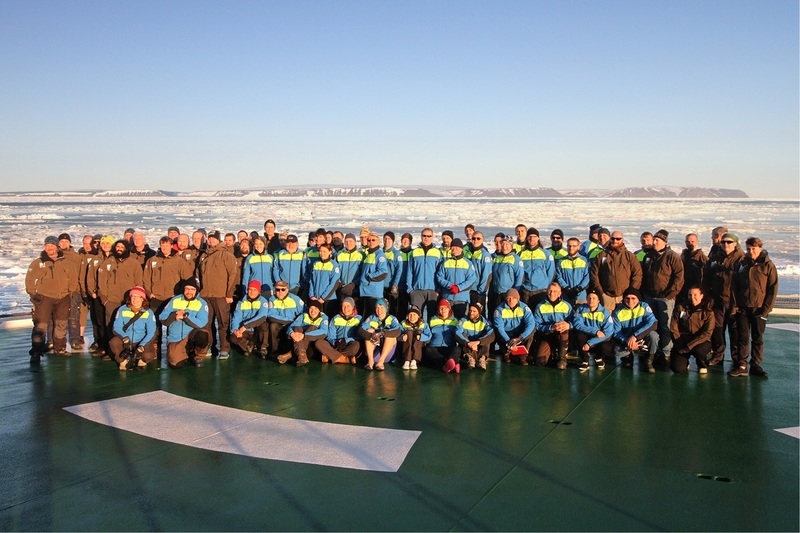 I will take part in Leg 1, together with 40 other scientists, that will depart on July 6 from Tromsø (Norway) and will arrive around August 20 in Barrow (Alaska, US). In Barrow we will rotate the scientific crew and then the ships heads back towards Sweden. Örjan Gustafsson and Martin Jakobsson from Stockholm University are leading Leg 1 and Leg 2, respectively. During the expedition I will try to keep you updated with our adventures, both regarding science but also about life onboard. You can also follow official SWERUS reports on Twitter (@SWERUS3) and Facebook. The official website for the expedition can be found at http://swerus-c3.geo.su.se/index.php/78-swerus/71-swerus-c3-program.